Do you like popup ads? Most people don’t, and popups often get a fairly bad wrap. This might be a bold statement, but I absolutely love popups. I think they’re one of the most powerful tools out there for marketers and visitors alike. In the early days of the Internet, digital marketers and webmasters used poorly-timed, obtrusive, and often spammy popup advertisements. The user experience was confusing, disruptive, and left a bad taste in many a consumer mouth. And it ruined the image of popup ads. See the example below. A stereotypical popup ad in the 1990s and early 2000s. Luckily, those days of spammy ads are gone! Enter the exit intent popup. These ads, known as exit-intent popups, are some of the most powerful and well-timed tools in a digital marketer’s arsenal. While they resemble popups of the past, they are a completely different tool (if used correctly). An exit intent popup example from Brooklinen. The ads are able to help a marketer reach one of many goals: reduce cart abandonment, get emails signups, increase downloads, etc. In short, popup ads are a powerful addition to a site. But how you decide the best offer for an exit intent popup? We’ve got you covered — here’s a list of the 19 best exit intent offers to try out, and the things you need to consider when building an exit intent advertisement of your own. Hope this guide helps you launch a successful ad on your site! When you’re deciding on an exit intent offer, it’s important to get into a visitor’s head. Think about why they came to a page, how they arrived there, and what they’re expecting. Once you’re in that mindset, then you can identify the best offer to give to them that helps them convert, and helps prevent a bounce from your site. In exchange for an email, J. Crew offers new visitors a 15% discount on their first purchase. E-commerce sites have an advantage when it comes to exit intent offers — there’s almost always wiggle room for a coupon when selling a good, plus there’s a direct quantification of value for both the visitor and website owner. J Crew’s popup does a great job on framing their value proposition for submitting an email (early access, exclusive sales), providing a timetable (only a minute), and minimizing the opt-out choice (“no thanks”). When you attempt to bounce from Zendesk’s site, you’re prompted with an exit intent popup encouraging you to schedule a live product demo of their HR software. They use a friendly photo and offer a quick no-pressure option to learn more about their product. While most visitors will still bounce, this module definitely helps Zendesk convert more visitors to demo sign-ups. GQ is a fashion brand, and their exit intent popup reflects that — with minimalist, slick design built into the module. This popup is most noteworthy for its approach. Rather than providing a sign up for a general email list, GQ positions this popup from what content you were looking at most recently. In this case, I read the article “how to talk to your barber and get the haircut your really want” and was served a relevant, specific email list to join. Note the copy and button color. He incentivizes clicking “Unlock The List” by using bold red type, and he discourages clicking “No Thanks, I’m Not Interested” by using a clear background and small type. KlientBoost gives their visitors something special on their exit intent popup: a custom proposal. They hint at what will be included in the proposal and make the offer seem directly personalized — even if it’s not. Wordsteam pushes their e-guide “Beginner’s Guide to PPC” on their exit popup window. By identifying what URL you’re reading, they serve a piece of content that they think you’ll enjoy. Their intent of this ad is to keep a visitor reading on the site and to funnel them to a higher converting landing page (an e-guide or an email gated piece of content). A longer time on site and page views per session can help improve site SEO and conversion rate. Don’t believe it? A study by Wolfgang Digital showed that by increasing time on site by 16%, conversion rates ramped up 10%. Ryan Robinson does a great job of positioning his email signup as a free course rather than a lead generation form. He’s able to target bouncing visitors, give something to them of value, and collect emails. Win, win! Note how he uses the headline “Hold on” to quickly grab your attention. He then provides validation for his content by including logos of reputable brands (Forbes, Entrepreneur, and Inc) that have featured his site. Neil Patel is a master at SEO and conversion optimization — and this is a great example of why. He provides a headline that hooks his readers (most of who are digital marketers). He then gives rationale for why you should take his quiz, and a time value for how long it will take. By taking the quiz, Neil can identify leads and better convert what would have been abandoned traffic. A quiz is a great method to increasing time on site and reducing bounce rate. 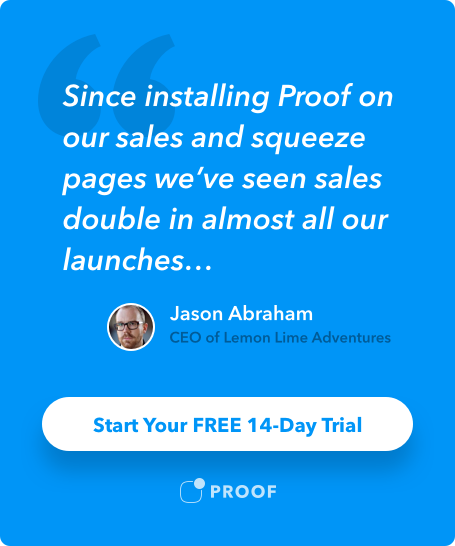 Hubspot uses their exit intent popup as a way to collect subscribers for their email list. They realize that if you’ve read a certain amount of posts on their site, you’re warm to their newsletters. They then back up the value of their content with the headline “Join 215,000 Fellow Marketers” — adding a bit of social proof to the mix. If 215,000 already joined their email list, shouldn’t you as well? When I attempted to bounce from a page on General Assembly, I was hit with a popup for why I should take a closer look at the curriculum for their Digital Marketing class. This popup provides value I did not get while initially on the site. A more extensive syllabus is something that would sway my decision of whether or not to sign up for the class if I was making this large purchase decision. Everlane provides free shipping to non-cookied visitors. This is an alternative offer to a discount code and can be a bigger factor for certain types of customers. Choosing one offer over another is difficult — and the decision of which to offer should be considered based on the age of your target demographic. One survey found that a discount often appeals most highly to 25-to-34 years olds, while free shipping appeals more amongst 56-to-65-year-olds. Consider the demographics of your visitors when deciding on what offer to include on a popup. On Fundera’s site, they present a simple question to qualify a bouncing visitor. “Are you a small business owner?” is direct, and draws the visitor back into the page, even if the intent was initially to bounce. By clicking yes, I expect to receive something of value on the subsequent page. Smart move. Sam Ovens does an incredible job of facing common objections that can cause visitors to bounce from his site, Consulting.com. To better convert visitors, he provides a 14-day money back guarantee, the choice to split payments out over time, and a special 6-month interest-free offer from PayPal. This simple bulleted list accomplishes a lot and certainly has increased his conversion rate by making it easier to justify signing up for his course. Scott’s Cheap Flights has built one of the biggest newsletters on the web by leveraging the concept of social proof. The sheer size of their list alone is reason enough to join — and they know it. By displaying that their list size as “1 million + cheap flight aficionados), they garner interest and give a reason to give them a shot. An alternative to a free shipping offer or discount coupon is the combined free shipping AND coupon code offer. Boxed provides a double whammy of value on their exit intent popup and gives the visitor a reason to give them a try. Their advertisement emphasizes their no membership fee — a feature that clearly differentiates them from Amazon Prime. For audience development, one of the biggest goals is collecting emails for a newsletter. On Instapage’s blog, they prompt exiting visitors with a sign up for their mailing list. They do a great job of communicating the subject matter of the emails they’ll be sending — noting how they’ll cover “the latest trends, tactics, and thought leadership for conversion and post-click optimization.” Instapage also provides a brand promise of no-spam to address any reservations a visitor might have about submitting an email. On the Digital Marketing Institute website, there is a maniacal focus on getting email submissions and phone numbers (leads) with which to follow up. Their exit intent popup is interesting in that it’s a direct ask. Note that this might not work for every brand. But if their customers are willing to provide the data, that’s reason enough to collect it. Sumo keenly identifies that a bouncing visitor may have wanted a more engaged conversation with a human before converting. For that reason, they offer a free call with their team when a visitor starts showing exit intent. This approach humanizes their brand and emphasizes their subject level expertise in a non-pushy, and even charming way. Misen uses a contest to grow their email list and collect the leads of potential buyer. People love free stuff, and the chance of winning a sizable gift card is enough to make many visitors provide an email. This is an interesting strategy because it allows Misen to grow their list without giving away free shipping or selling their products at a discount. Now that we’ve gone over great exit intent popup examples and use cases, here are some important features to consider when building an exit intent ad. A headline is the first thing a visitor reads when landing on any webpage. The same logic applies to pop-up ads. If you’re unable to quickly hook a reader and give them to read on, you’ve likely lost the customer for good. A successful call to action is well-worded, actionable, and succinct. There’s a reason “Read More,” “Find Out Why,” and “Buy Now” are scattered across the web. These CTA’s have been tested time and time again by digital marketing experts — and lead to a high exit intent conversion rate. Study up from your competition if you’re ever stumped on what CTA you should include in an exit intent ad! For an exit intent popup, you need to clearly communicate the value prop you’re offering to the reader. This is a situation where bulleted and short text is very helpful — readers want something that is thorough without being overwhelming. Did you know 90% of information transmitted to the human brain is visual, and that we process images 60,000X faster than text? Take a lesson — and be sure to include evocative and on-brand images on an exit intent popup! Did you craft your ad with an end user in mind? By targeting an advertisement to a certain persona, you guarantee that it will be more focused on helping reach your goal. Exit intent ads are able to be targeted to specific URLS, customer segments, and more. Try out a few targeting methods and see what works for your brand. One of the most important things in regards to exit intent is timing. Hitting a customer too early or a customers that’s actually not bouncing can tarnish your brand. So be careful! Luckily for you, most exit intent software recommends the best practice when setting timing for your campaigns. If you have a huge in-house dev team, you probably could set up an exit intent popup on your own. But for the rest of us, there are some great software tools that can help you quickly and easily launch a popup ad. Hubspot’s free exit intent popup software allows a site to trigger pop ups based on user behavior. You can set time triggers, scroll triggers, or page targeting to display at the right time and place. Another advantage of Hubspot’s version is the ability to integrate with a variety of popular software programs — including MailChimp, Campaign Monitor, Constant Contact, Shopify, and WordPress. OptinMonster’s plans start at $19/month and can be a great choice for users looking for more complex use cases for exit intent technology. Their exit intent modules can be used for both cart abandonment and lead generation. If you’re looking for a well-designed product with an easy to update interface, Sleeknote might be the right option. You can use their exit intent overlays to collect emails, guide returning visitors, increase sales, or provide support. Sleeknote starts at $55/month and is priced by website traffic. When a website visitor shows exit intent, you know one thing: they are planning to leave. As a marketer, it’s your responsibility to do something about it — even converting 1% more traffic can have a huge effect on your conversion rate and top-line revenue. While an exit intent ad could be one of many communications you have with a potential customer, it could also be the last. Not running this type of ad is like seeing an attractive girl or guy and not talking to them. Even if you’re soulmates, not having the guts to communicate and exchange numbers could mean goodbye forever. Sure, if you live in a small town, you could cross paths again. But the Internet is like living in the world’s biggest city — bigger than New York, São Paulo, Mexico City, and Beijing combined!